Q: What does this new relationship mean to SHOWA? A: “With this announcement we will see SHOWA branding increased everywhere. Until now we have been concentrating only on the technical side, to develop new materials and new technologies. Now, for us, it’s important that everybody knows about the SHOWA brand. 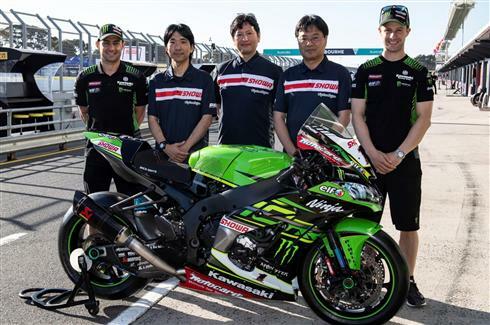 Already KRT is a strong team, so we thought, “Why not add more support and transmit the SHOWA brand to everybody through KRT?”.Our long term intention is that a team using SHOWA win every world championship race category. Ofcourse we would not change our passion of supporting KRT, there is no change to that part of our philosophy”. Q: For racing you need more servicing as the forks and shocks work so hard, but on the street this is not the case. How much can you take from racing to the street without having to have a SHOWA technician coming to your house every few months? A: “Already the BFF front fork has been implemented on the street bike Kawasaki, but not exactly the same material. We also have to think about durability and take into account the bigger – and many more – bumps you experience on the street. And of course – as you say – we cannot visit all end users to do maintenance check every few months! In this point of view, we cannot transfer exactly the same material to the street bike, but the basic technical functionality, and the idea, is very similar. All street riders maybe cannot feel 100% of the sensations from the track situation.. but I think all the riders can feel the difference if the suspension is better – that is the SHOWA philosophy”.